Some may say that seeing some blood while brushing or flossing is normal. We’re here to tell you that it’s not. In fact, blood is never normal and may even be a sign of gum disease. Gum disease a serious oral health problem that requires professional treatment. If it’s not treated quickly and effectively gum disease can lead to tooth loss and other whole-body problems including stroke, heart disease, and diabetes. Experiencing any form of tooth pain is your mouth’s way of telling you that something isn’t right in there and that you should get help. 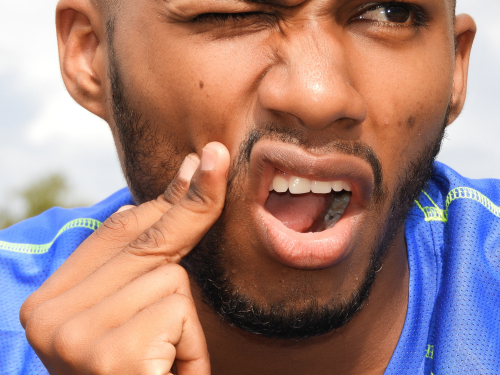 While the reasons behind toothaches can vary from anything from a cavity to a damaged dental restoration, the best way to get to the bottom of it and get relief is to schedule an appointment with your dentist in Austin as soon as you can. Having sensitive teeth could be a result of something as simple as brushing too hard or whitening your teeth too much. Other times, however, tooth sensitivity can also be caused by more serious things such as eroding enamel or receding gums. Both of these issues require a professional diagnosis and treatment plan in order to relieve the painful zingers of sensitivity. Dry mouth may be no big deal, but if doesn’t go away it could be a sign of serious problem. Bad breath is often a sign of gingivitis, which is an early stage of gum disease. If not treated quickly the gingivitis can easily progress into gum disease and may eventually lead to tooth loss and the other whole-body concerns we mentioned earlier. Whether dry mouth is caused by medication you’re taking, is a byproduct of aging, or is a symptom of gingivitis, see your dentist to fix the problem once and for all. These dental problems aren’t something to ignore and won’t go away on their own. The best way to diagnose and treat any of the issues above is to call our dental office in Austin as soon as you notice something isn’t quite right. After all, many oral health complications are treated successfully and easily if caught early.